Here at Children’s Ark Academy, we like to take care of the whole child. 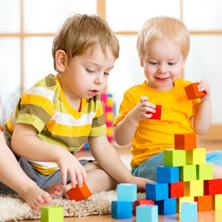 Most people think of preschool as being all about mental development, but there’s more to it than that. 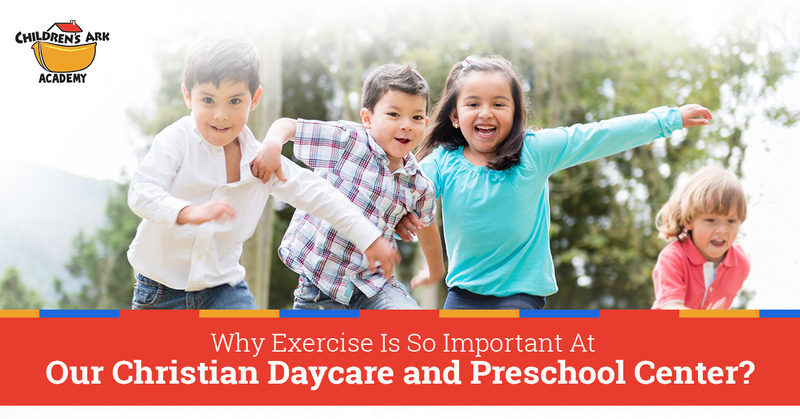 In fact, our Christian preschool takes care of more aspects of a child’s development than other early childhood education centers because we’re also involved with their spiritual upbringing. This holistic approach is very important to the way we teach, and we focus on both of them heartily. But it’s important that the physical needs of children are also being met, and that often means ensuring they get the playtime they need. At first it might not seem that exercise would be as important as traditional teaching, but it turns out that it’s a vital part of how kids learn. 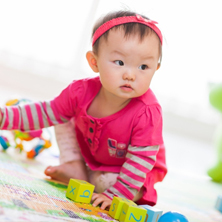 Let’s take a look at why playtime and exercise can be so important to the way children learn. Let’s start this off with a very simple example: schools that cut back on recess see worse test scores than schools that keep recess in place. This might seem counterintuitive. Shouldn’t more time inside mean more time learning? As it turns out, that’s just not the case. The brain needs to to rest, and giving kids a break allows them the rest time they require. When they get back inside from recess, they’re ready to “hit the books” again. And it’s not just taking a break that helps kids learn more. Exercise increases the level of brain-derived neurotrophic factor (BDNF), a protein in the brain necessary for the growth of brain cells. It also stimulates neurogenesis, the growth of new neurons for brain development. BONUS! : Kids don’t just learn better and absorb more when they exercise. 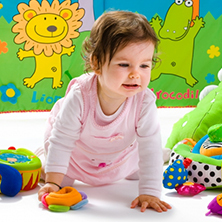 In fact, being outside and playing with other children increases their social skills as well. When playing a game, they get to investigate what does and doesn’t work during conflict resolution. Getting exercise can also reduce depression, something that often goes undiagnosed in children. After all, exercise releases endorphins and improves moods of children and adults. Plus, when kids are out exercising, they’re also interacting with the world and seeing how it works (you’d be amazed at what a see-saw can teach about levers!). The idea of our bodies being important to God is laced throughout the Bible. Whether it’s about being a temple of the Lord or offering our bodies as living sacrifices, our bodies should be used to honor God. And let’s not forget that God doesn’t want anyone — including ourselves — to destroy our bodies according to 1 Corinthians 3:16-17: “Don’t you know that you yourselves are God’s temple and that God’s Spirit dwells in your midst? If anyone destroys God’s temple, God will destroy that person; for God’s temple is sacred, and you together are that temple.” So remind kids that God has given us our bodies and wants us to take care of them. Exercise can also be a very good way to introduce kids to Biblical truths that they might never have thought about before. (It’s okay, many adults miss them too!) Take, for instance, the fact that Jesus walked pretty much everywhere and got a lot of exercise in that way (Palm Sunday being a notable exception). On most days during his ministry, he’d walk many miles to get from town to town. Sure, sometimes he rode in a boat, but the disciples would have been rowing when the wind wasn’t blowing. Now that we think about it, Jesus was such a servant that he was probably rowing harder than anyone! Speaking of the disciples, think of Simon Peter and Andrew, who were fishermen. Kids can be reminded that fishing then wasn’t like the fishing that they might know today. Simon Peter and Andrew would have had to be incredibly strong in order to get the nets of fish back into a boat. Finally, let’s get back to Jesus. Being a carpenter, he would have become strong wielding a hammer, carving the wood, and moving the pieces of furniture into place to join them. Jesus might have been peaceful, but he certainly wasn’t a wimp! Let’s not forget how important exercise is to kids’ bodies. We’re all aware that childhood obesity is becoming a huge problem. Nearly one out of every five children is obese in the United States, and the number of obese kids keeps rising. While there are many factors as to why children are becoming obese, diet and exercise (or a lack of it) play huge roles. But exercise is more than about staving off obesity. Exercise builds stronger muscles and bones. It lowers blood pressure and cholesterol levels, and it also reduces the chances that they’ll get type 2 diabetes. (Even people who aren’t overweight can develop type 2 diabetes if they don’t get enough exercise.) Plus it’s heart healthy and even great for digestion. Exercise also increases proprioception, which is the constant feedback loop between the body and the mind. Basically, the mind and body work better together, which increases a balance and helps kids exercise even more without injury. It’s important that kids know how important exercise can be throughout their lives. If we encourage it now, they’re more likely to stick with it and understand the benefits it can provide them in the future. We’ll do our part making sure kids get outside, and we hope you’ll join us is making sure that they get some form of exercise throughout the day. It’s important to remember that exercise can take on many forms. It doesn’t have to be “okay, here’s our 30 minutes of exercise today when we all put on leg warmers.” Exercise can be taking a long walk, running around chasing a frisbee, or dancing. We know you’re concerned about the entirety of your child, including their mind, body, and spirit. We hope we’ve convinced you that exercise is a very important part of all three. If you’d like to take a tour of our Christian preschool to see the space in which they’ll be having their daily activity, we’d love to have you stop by. Contact us to schedule a tour today!